Here are some Overlay Crochet jewelry pieces that I designed using regular old #5 DMC perle cotton with a size 10 or 12 hook. Oh so many colors!!! The first one on the left is a brooch that I designed in the Overlay Crochet Designers workshop at CGOA, taught by Melody MacDuffee. 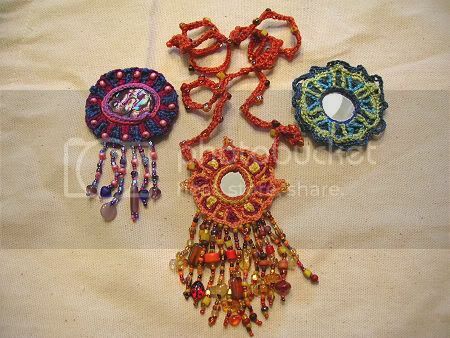 The other two are crocheted around mirrors.